Not as good as Under the Tuscan Sun, but very readable. Oh, Italia! How I adore you! 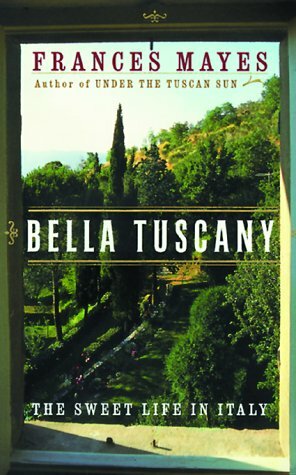 The follow-up to Under the Tuscan Sun, Bella Tuscany is less about the home Ms. Mayes and her partner have built than their settling into the landscape and community. They spent more time in Italy during this memoir than they did in the last, using up a great deal of vacation time I suspect! I really enjoyed reading Ms. Mayes descriptions of the Italian landscape; they were as evocative and rich as in her first memoir. They spent more time touring around small Italian towns in this memoir, and a lot more time visiting local wineries and farms. This is what I loved about the sequel, I felt like Ms. Mayes was delving deeper into the Italian mindset; I felt like I better understood the area she was living in this time around. I also loved her musings about the Italian language - I've tried to learn Italian too and it's exceptionally difficult! I know that she has written a third memoir about her life in Italy, and another about traveling to Greece. Big plans to track down copies to read in the sun! This a lightweight summer travel read that rhapsodizes about the good life in Tuscany. A return to the author's senses-filled life in Tuscany. As wonderfully evocative as its predecessor. Sequel to UNDER THE TUSCAN SUN; Frances Mayes has found happinessin love and location. A form of escape reading, but quite well-done and enjoyable. Highly recommended. Don't listen to the author reading her own work, though. Sequel to Under the Tuscan Sun, and just as good. This book is an easy read. However, it made me hungry and craving fennel. It also sorta inspired me to work on our garden. It reads somewhat like a diary of a year in Tuscany with side trips including Sicily. Frances Mayes loves Italy, food , wine , trees and flowers and makes you love it all too.